The end is… not so near. I closed that view and checked the meeting invite again. No, it was definitely this millennium. I clicked “Calendar” again, thinking it was a fluke. August 31, 4500 came up again. I tried clicking one of the September dates – no dice. I could back up to July 4500, though. So apparently, August 31, 4500 is the max date in Outlook. Now for the really fun part. I accepted the meeting. 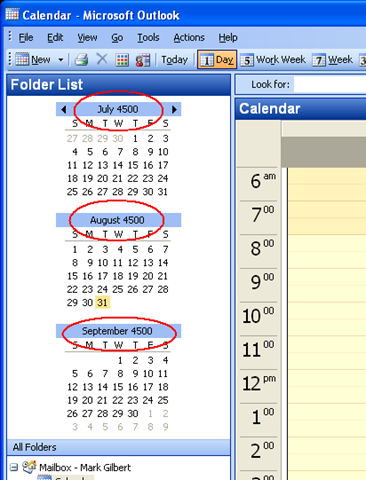 If clicking “Calendar” jumped me 2500 years into the future, what would accepting it do? Well, obviously it put it on my calendar for January 21. Such a let down. I really wanted to give my project manager crap for going a little around the bend when it came to proactive planning. Way, WAY around the bend. But hey, good thing we found this Y4-1/2k issue when we did. As soon as we’re done dealing with the monolith this year, and the end of the UNIX world in 2038, we can get cracking on this one. January 7, 2010 Posted by markegilbert | General	| Comments Off on The end is… not so near.